Our bodies are anatomical maps of our personal experiences. Studies have shown that living through physical or emotional trauma can be stored in the cells, leaving us with chronic pain, inflammation, or stiffness, often in the shoulders, neck, and back. So it’s no surprise that even a small bit of stress can wreak havoc on our posture. Good posture not only protects the spine—a valuable extension of our brains—but also helps produce more confidence and awareness of both our bodies and our surroundings. When we begin to clear emotional blockages through exploring better posture practices, we are, both literally and figuratively, opening ourselves up to the world. And here’s the good news: Open shoulders and an elongated spine are only a few minutes away. Try this six-minute yoga sequence for better posture. Place both feet parallel, hip-distance apart with equal weight in both feet. Arms are alongside the body. Straighten the legs (if you hyperextend, put a small micro bend in the knees). Tighten the abs and roll the shoulders back so your chest can move forward and up. Then, imagine a string lengthening your spine from the tip of the tailbone all the way up through the crown of the head. And, most importantly, remember to breathe. Inhale and stretch your right arm straight out to the right, parallel to the floor. Rotate your arm inwardly and sweep the arm behind your torso into the hollow of your lower back. Roll the shoulder back and down, broadening through the collarbone and getting taller through the waist. Stretch your left arm straight up, turning the palm back, and then bend the elbow and reach down for the right hand. If possible, hook the right and left fingers or use a strap. Switch sides. On your next exhale begin to hinge at the hips and come into a forward fold over the legs as you feel your spine extend long. Grab opposite elbows with your hands and let the head and neck release. If you have tight hamstrings, bend the knees and see if you can bring your belly closer to your thighs. Breathe into any spinal discomfort and stretch out all the muscles of the back. Come to sit. Use a bolster or folded blanket and bring the narrow edge up against your sacrum. 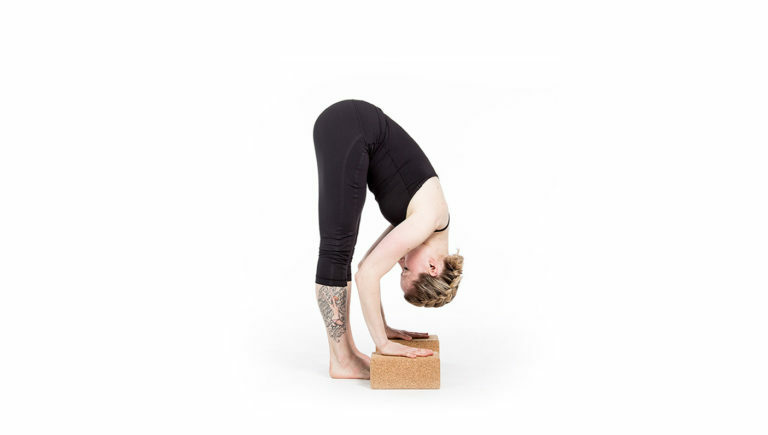 Bring the feet together and let the knees come out to the sides, supported on bricks to prevent puffing in the groins. Begin to lower yourself onto your prop, keeping the spine supported and the front of the body aligned and open to receive. Draw the shoulder blades closer together and find expansiveness in your chest. With each inhale fill yourself up with breath, and with each exhale, let go. Featured image via Stocksy. Supta Baddha Konasana photo by Mario Covic.